Here in San Jose, we’re lucky to have Farmers’ Markets all year round, but they’re extra-special in the summer. The fruit stands are a riot of color: peaches, plums, nectarines, little green sour plums. But you have to get there early or the blazing sun can literally cook the fruit to a mush by the middle of the day. And then there’s the strawberries, and blackberries and blueberries and raspberries. It’s fascinating to try and capture the light: so cool and blue-green under the canopies and blazing hot-white outside. My kids love sampling all the tasters. Speaking of the kids, their favorite part of the market? The Shave Ice stand, which only appears in the summer. Rainbow Sherbet for one. An extra-sour medley for the other. It all tastes the same to me. 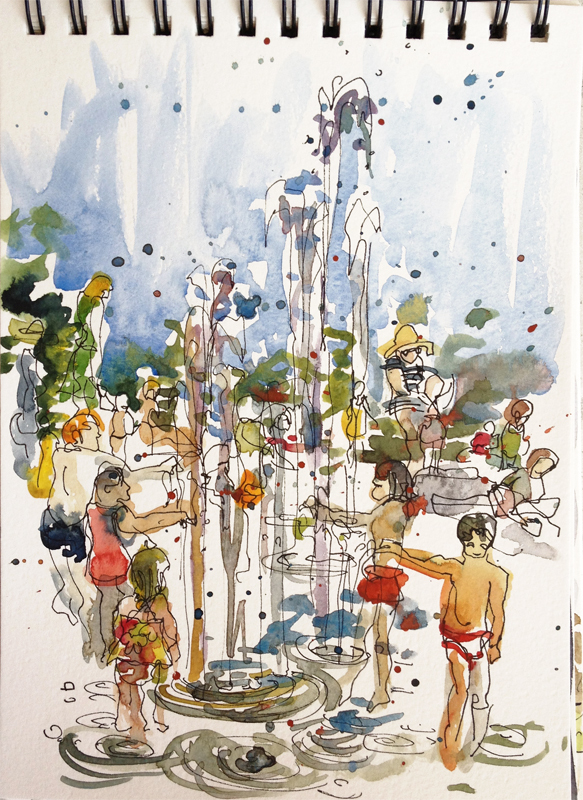 I usually sketch at the Blossom Hill Farmers’ Market in Almaden , but once a while I’ll go over to the market in Los Gatos and then the kids are in for a very special treat: the fountains in the park right by the market are always full of giggling under-10s. 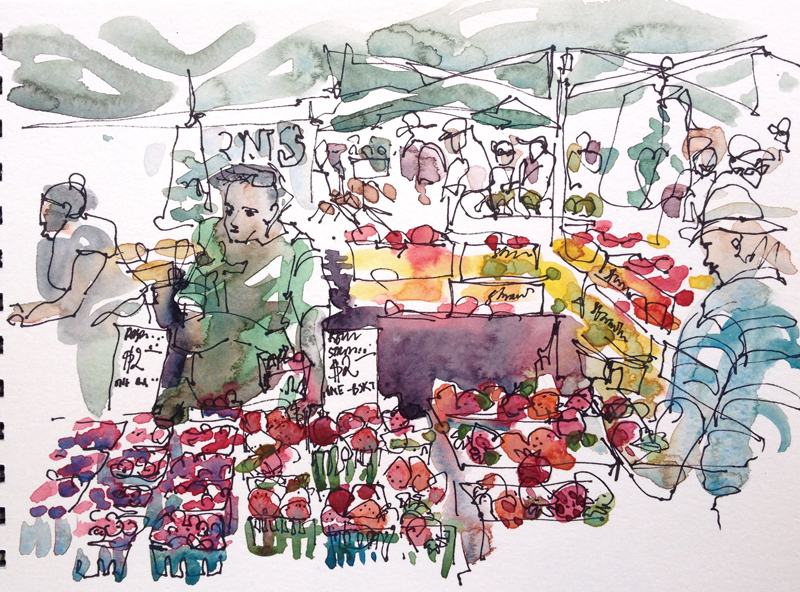 You can see a full set of my Farmers’ Market sketches here on flickr . 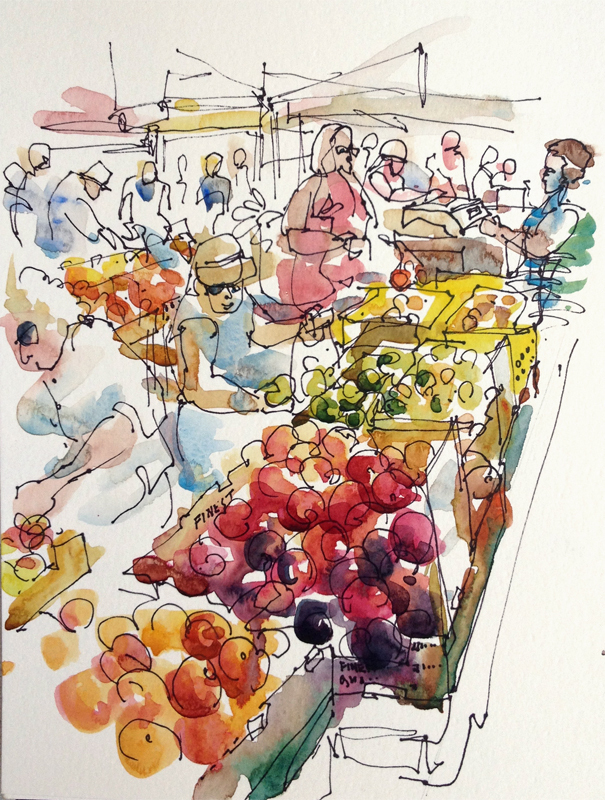 This entry was posted in california, Close to home, Silicon Valley and tagged almaden, california, family, Farmers, food, fruit, location drawings, los gatos, market, people, suburbia, summer, urban sketchers. Bookmark the permalink. Well done! You capture perfectly all the movement in your sketches! Fantastic–love how you capture it so completely with such loose lines and swooping color. The details like the berry baskets are wonderful. Love the colours, lines! All are really fabulous . Great sketches. 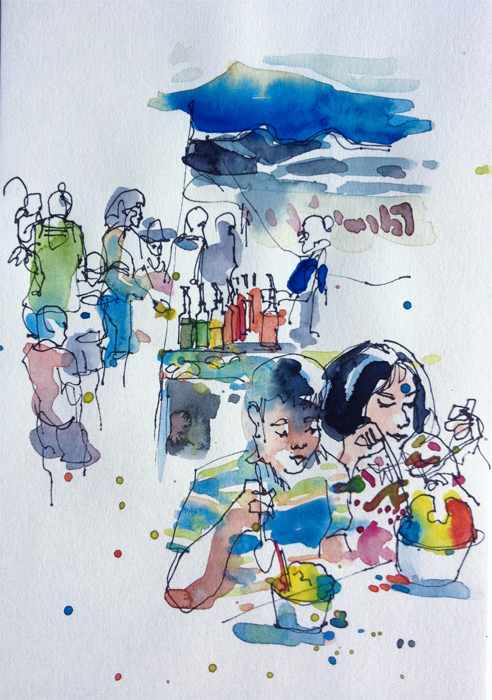 Love your use of colours and loose lines to convey they atmosphere. I wish I could draw/paint like you! I love your free, loose style.